Thread: INTP is... A Visual Guide. The Idea here is to come up with visual images that say: INTP. GOAL: Make a slideshow (hopefully with a soundtrack provided by our audio artist here) and post it on INTPx's Youtube channel. I'll start with something I'm sure most will recognize. Sigh. This means I'll have to hide my spare key better. EDIT: More sick, without being able to READ the titles of some of those books, I know what they are from the cover/spine design. Aieeee! That stresses me out for the visual busy-ness and for the asthma-inducing dust mites but I guess neither of those have to do with being an INTP. Can you find stuff in there? That's what would motivate me to organize it all, I hate wasting time in the external world trying to find stuff. If you can find whatever you need, more power to you. You talk like a Jerengi! It does seem very cluttered...hopefully it is a storage space, not a workspace. Indeed. Looks familiar. Ignore the neatnicks. Personally, I was a bit disturbed that I could see reflections on the lower shelves. That means somebody has been dusting. INTP status in question. I agree with you, but I although I value visually organised spaces, my room is way messier than that at the moment. So I recognise it. Do we take our own pictures? Are drawings allowed? You guys are making me remember college ribbing about the Embrace of Chaos. Anyways, I had this whole M*A*S*H-esque skit about the Screwy Decimal System. The 7 dash R stroke 12 Screwy Decimal System, that is. We're mutants. There's something NOT wrong with us, something very, very NOT wrong with us. Something seriously NOT wRoNng with us! Like many that find themselves in our little community here, I read Paul James' INTP profile and it seemed like the dude was in my head/home. Consequently, there was a link to the old planet...and many here have cursed Paul James since. When an INTP lives alone, his home is usually spartan and utility-oriented. There will be little or no decorative objects, electronic equipement will be in abundance and the importance of any object will depend only on its usefulness. The general style of the home is largely irrelevant. When an object is put aside, not to be returned to for a while, it will lie fully ignored until used again. Objects which lie unmoved for more than about 48 hours usually become invisible to the INTP, until such time as he has a use for them again. For other temperaments whose need for tidiness and order in a house is strong, this lack of concern in this area may seem despairing. For the INTP, however, no problem exists. Corners of rooms, table tops and cupboards may become cluttered with objects, but while they don't move they remain effectively invisible and are unimportant. Indeed, less mature INTPs have a reluctance to move objects at all, for the desire to remain detached and not physically interact with the world can be strong. The one thing that will force an INTP to tidy his home radically, even when alone, is when the clutter eventually gets in his way and hinders some activity. Often, however, the offending objects will merely be moved into another corner where they can spend some more weeks being invisible. When an INTP lives with a partner and perhaps has a family, he learns the necessity of focusing on the details of tidiness. This is not usually difficult, since tidying a house is an activity which can be clearly defined and, hence, the INTP can focus on it by treating it as systematic work. I should also state that my INTPishness has often been questioned here, and so I wouldn't be taken aback by a wtf??? Anyways, bleeding out a little personal blood here in furtherance of the ultimate goal of growing our community with new blood. As is the purpose of the request for images. YouTube has a dramatically smaller scope vs Google when it comes to searches. Splashing INTPx's Channel with frequent mentions of "INTP" and obvious links to INTPx Prime seems a smart exploit IMO. BTW, with the intended purpose in mind, and assuming you don't have a AKA, Welcome to the Bat cave! Additionally, An INTPx Artwork slideshow video (with INTPx brewed music) is another idea for YouTube. Last edited by OrionzRevenge; 02-11-2014 at 09:25 PM. You might be an INTP if you aren't sure if a bookshelf is a storage space or a workspace. 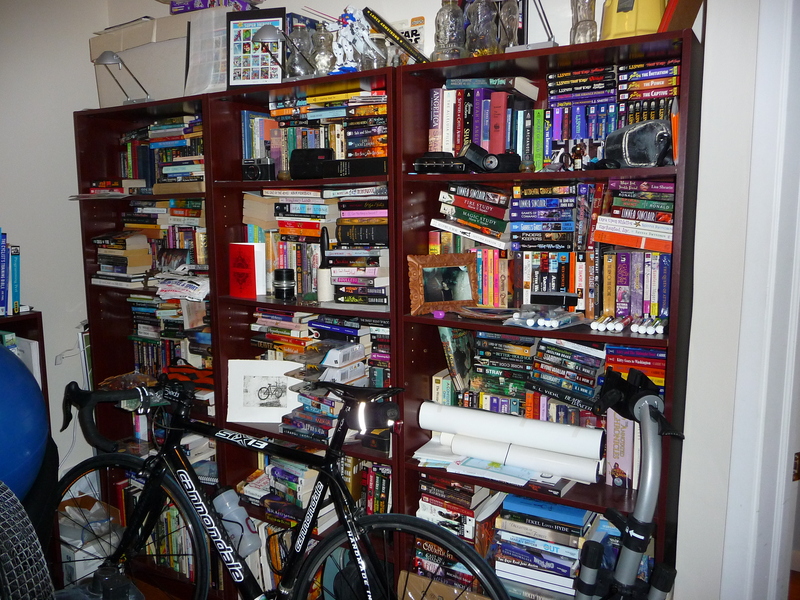 I notice an awful lot of genre fiction on that shelf. Where are your reference books hiding? I know you have some. INTP Protip: Kindles free up shelf space for toys. Klingon dentists only work on bottom teeth, apparently. Actually a visually sparse environment was something I developed as a kid then later fine-tuned in college to deal with my INTP absent-minded-professor-ness. I spend so much time internally that my external world needs to be kept as simple as possible, I just don't have time or energy to deal with the fallout when it gets messed up. I'd rather think about cool INTP ideas than look for my car keys. The dust mite thing is just because I like to breathe.